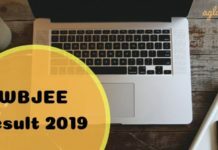 Home Engineering WBJEE WBJEE 2019 Admit Card – Get the Direct Link Here! WBJEE 2019 Admit Card – WBJEEB issues the Admit Card on its official website, wbjee.in. Candidates who had submitted their online applications before January 22, 2019. 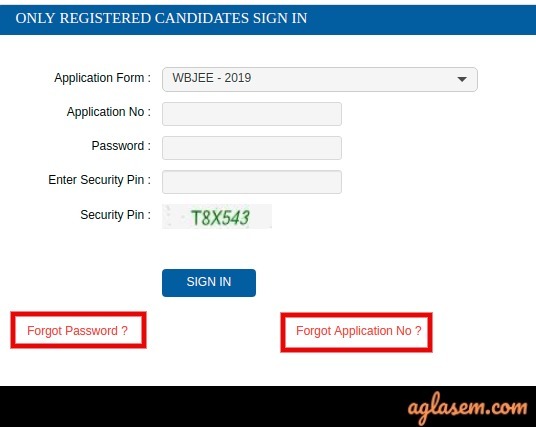 To download WBJEE 2019 Admit Card, candidates need to enter their application number and password. 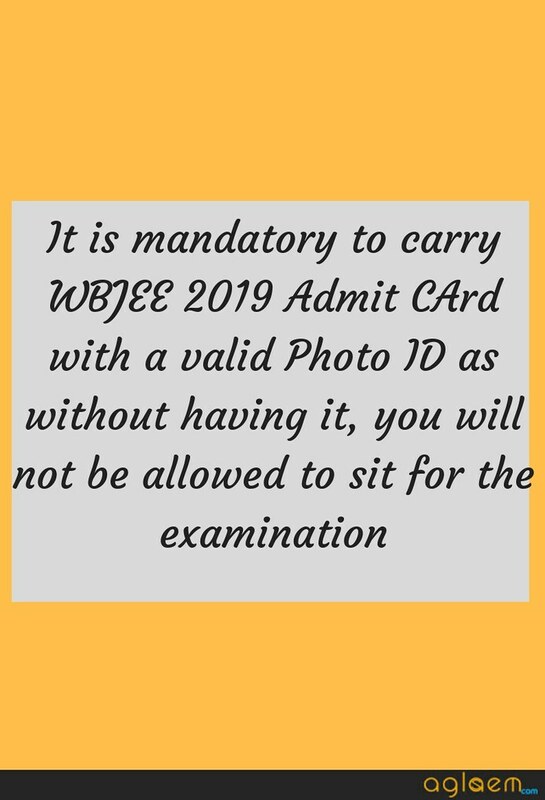 The WBJEE 2019 Admit Card is an important document and with it, photo id and one photograph will be required to be carried to the exam hall, on the day of the exam. The WBJEE 2019 admit card will contain details about the candidates and examination like the center, center address, exam time, and more. To know more about WBJEE Admit Card, keep reading! The Board issues the WBJEE 2019 Admit Card on the basis of the details provided in the application form. The verification of documents is done during the counseling round. Candidates can able to check WBJEE Admit Card 2019 date, exam date, duplicate admit card date from the table provided below. Admit Card: Candidates can download their WBJEE 2019 Admit Card from here. Candidates can follow the below steps to generate their forgotten crdentilas. Visit the official website or directly click on the link below. Just below, the already registered candidate’s login, a candidate will find the “Forgot Password” or ” Forgot Application No.” Choose accordingly. A verification code sent via text message (SMS) to your Registered Mobile No. A reset link sent via Email to your Registered Email address. As a first step, candidates will have to open the official website or can click on the link which will be updated here. After following the above step, candidates will have to log in by entering Application Number and Password. After entering the login credentials, candidates will be able to download “WBJEE 2019 Admit Card”. As a last step, candidates can take a printout of the WBJEE 2019 Admit Card so that it could be used for future references. What to Be Carried With WBJEE 2019 Admit Card? One coloured photograph – It should be the same as uploaded during the application form filling. The candidates need to carry an original Photo ID. Candidates must have to keep in mind that immediately after downloading WBJEE 2019 Admit Card, candidates will have to cross – check their respective admit cards. It is advised to candidates to check all of their details mentioned on the admit card. If in case, the details mentioned on the admit card are incorrect then they must immediately contact the governing authority as earliest as possible. The WBJEE Board will issue admit card only until the exam date. Once the exam is over, the candidates will not be able to download the admit card. However, if a candidate needs a WBJEE 2019 Admit Card duplicate copy, it will be provided till the 31st August 2019 from the board. To get the duplicate copy of the WBJEE hall ticket, the candidates will have to apply to the Board by making a payment of Rs. 500. The payment is to be done through demand draft, prepare in the name of “West Bengal Joint Entrance Examinations Board”, payable at Kolkata. Also, Few General Instructions will be given in WBJEE 2019 Admit Card. In Category I – only 1 answer option will be correct. Category II – only 1 answer option will be correct. In Category III – more than 1 answer option will be correct. Negative Marking in the Exam – In Category I negative marking is of 1/4 marks. In Category II it is of 1/2 marks, and in Category III the marks will only be awarded if the candidates will choose all the correct answer options. Candidate should carry the admit card in good condition. Candidates should not be mutilated, soiled, or distorted. Candidates will have to keep in mind that they can generate duplicate admit cards but only till the date of examination. So, in conclusion, candidates must keep their admit card in a safe place so that it could be used for future purposes. WBJEEB does not verify any information provided by the candidate during online application. Admit Cards are issued on the basis of the information provided by the candidate. It is very important to secure the WBJEE 2019 admit card even after the exam. It will be required for counselling and admission but the candidates will not be able to download the duplicate admit card. It is mandatory for the candidates to reach exam hall at least 30 minutes before the examination. Candidates will have to go through frisking at the hall. The candidate can only appear for the exam centre allocated to them. If candidates will not carry WBJEE admit card 2019 and a photo id and coloured photograph with themselves they shall not be allowed to take the examination. Match the OMR and Question Booklet number. If it does not match, inform the invigilator. In block letters, write the name, centre name and put the signature on appropriate space on the OMR sheet. Make sure your roll number, photo, and signature on the attendance sheet are correct. Do not carry any study material, gadget, or unfair means. Question. When can I get the direction to reach the examination centre? Answer. Address and Landmark of the centre will be mentioned in the WBJEE 2019 admit card. Question. Can I change my exam zone? Question. What happen if do not re-upload correct photograph and signature? Answer. If a candidate does not re-upload corrected photo or signature, admit card cannot be issued. Question. What are the things in must carry on the examination day? A copy of coloured photograph as uploaded during online registration. Any original photo ID card such as Adhaar Card/ Voter ID/Passport/School ID. Question. When shall I be able to download Amit Card? Answer. In order to download WBJEE 2019 Admit Card, candidates can check the dates mentioned above in this page. 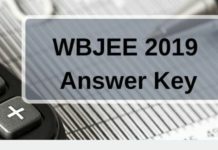 If you have any query regarding WBJEE 2019 Admit Card, Please comment below.